The True North – a cruiser with 18 double cabins, gourmet chefs, scuba gear, and a helicopter onboard – is the best way to access the Solomon Sea, an empty swath of the South Pacific where WWII shipwrecks, coral reefs, and underwater volcanoes await. 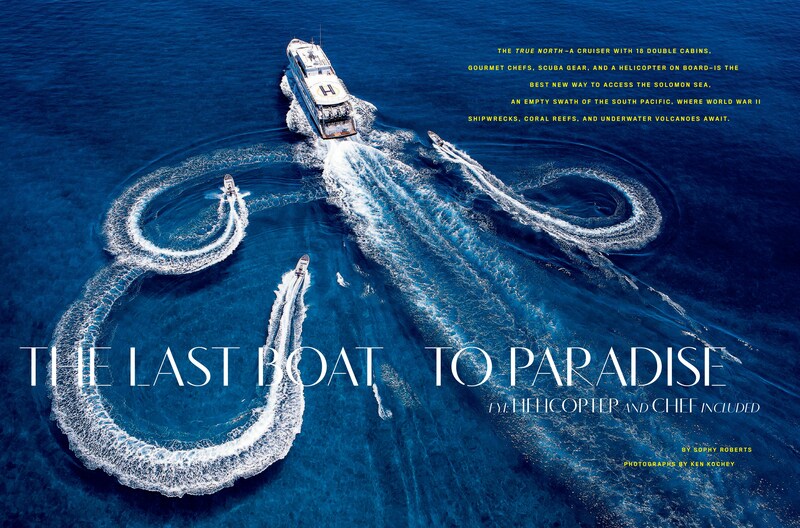 Article by Sophy Roberts, photography by Ken Kochey. It is after dark when we pull away from New Britain to traverseone of the deepest oceanic trenches in the world—nearly 30,000 feet below. 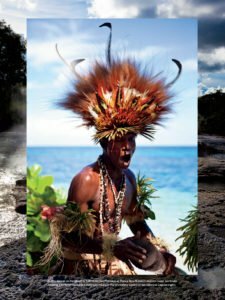 Our means of passage is the nimble expedition cruiser True North, which, from October to December, makes almost a complete circumnavigation of the island of New Guinea in a series of 5- to 11-night itineraries. I’m sailing the Solomon Sea (part of Melanesia, an area in the South Pacific bearing little relation to the political entity of Papua New Guinea, which governs most of the region), using this Australia-flagged boat with 18 double cabins, gourmet chefs, scuba gear, and a helicopter on board. We talk at the bar—me and more millionaires than I’m used to in one room, all but six of whom having sailed on the True North before. They’re exceptionally well traveled, which is exactly why they’re here: The True North represents one of the few ways of accessing this empty swath of the map without chartering a private yacht out of Cairns (for $245,000-plus per week) and sailing up from Australia’s northern tip. 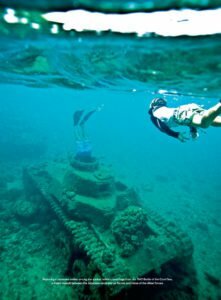 Among the group is a marine biologist, who talks about the peculiar creatures that can survive trench-living over five miles down, and a leading Australian historian, who suggests that a missing Allied WWII submarine may lie in this mysterious oceanic crevice. 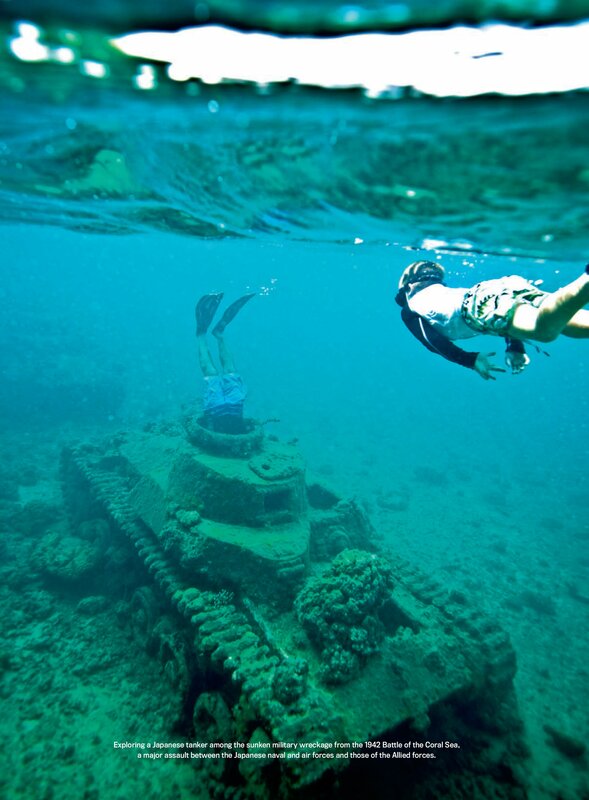 In shallower waters, we dive among the wrecks of the Pacific War, including a Japanese tank and a Zero fighter plane now gathering coral on the ocean floor. Yet even when I touch the broken propellers, I struggle to imagine a good reason for fighting in such lonely parts. Easier to understand is how the presence of foreign ships and planes led to the evolution of “cargo cults,” whose believers thought that gods were dropping goods from the sky. In this Pacific wilderness, anything that breaks the horizon feels like it belongs to another world. With the New Britain Trench behind us, we wake up to salty mist hanging low over the water, glassflat, like a mirror. Our captain, Chad Avenell, says we’re sailing through the tail end of a cyclone sweeping down from the Philippines. The moody light turns the paradise of postcard clichés—blue lagoons and arching palms—into something spectral. We anchor off a spit of sand forming part of the Lusancay Islands, made up of reefs and sandbars. On one island an eel-thin streak of sand snaking out across the water there is a small hut made from pandanus leaves. Our boat’s managing director, Craig Howson, says the last time the True North came by, in 2013, the hut belonged to a fisherman; he was living there with his wife and child, their nutbrown bodies having the island all to themselves. Now they have gone, most likely back to the Trobriand Islands, from where they came. I ask Howson what’s there, in this next string of low-lying coral islands 50 nautical miles to the west. “A Rolling Stone,” he says. “And yams. A lot of yams.